Scars left from acne can be a great cause of concern to affected patients, especially if they occur on the face. Unfortunately, there are patients for whom conventional treatments such as retinoids, microneedling, peels, and lasers have not produced an adequate response. For these patients, treating their atrophic scarring with hyaluronic acid fillers may be a solution. Overall, these treatments aim to revitalize skin that has pitted or changed shape from scarring by injecting dermal filler carefully into the dermal/epidermal layer underneath the atrophic scar. This can be achieved by either using a targeted approach to treat individual scars with a volumizing filler, or by treating an entire area with a less viscous dermal filler (such as skin boosters, which are used mainly for hydration and skin conditioning). That being said, all types of fillers are used to treat acne scarring. Scarring from acne may be caused by nodular and cystic acne. Abnormal healing of the skin following inflammation results in scarring, of which there are 2 typical types: atrophic and hypertrophic. The type of scar that is formed depends on the amount of collagen gained or lost during the healing process. The pathophysiological processes that form atrophic and hypertrophic scars follow similar pathways through 3 stages of damage and healing. Initially, the damage inflicted by the inflammation of a blocked sebaceous gland results in blanching and vasoconstriction. Then, activation of the immune response results in the flooding of the area with macrophages, neutrophils, lymphocytes, granulocytes, fibroblasts, and platelets in anticipation of granulation via immune mediator release. Granulation progresses until the final stage: matrix remodeling. At this stage, fibroblasts and keratinocytes flood the area with enzymes that determine the final structure of the extracellular matrix (ECM). It is at this point that scarring can potentially occur, as a result of any imbalance in the enzymatic breakdown and rebuilding of tissue. Filler treatments are only effective on atrophic scars. These are scars that are depressed, and can be grouped into the boxcar, icepick, or rolling categories, based on the shape of the scar indentation. By far, the biggest issue when discussing treatment with the patient is the duration of results. The effects of semi-permanent filler eventually wear off and will need to be repeated. Even so, treated scars rarely return to their original state because of a degree of subcision that happens during administration. Moreover, the duration of effects is dependent on the type of filler used. In the case of hyaluronic acid filler, effects often last 6–12 months. Because results are instant and improve over the course of the following weeks, this treatment is suitable for patients preparing for a big event. However, keep in mind that timing is key: the patient is to seek treatment in the weeks prior to any event, and not immediately before. In terms of pain management, the practitioner may find that administering topical anesthesia may make visualization of the scar more difficult due to the associated local edema. Anecdotal evidence suggests that this treatment is more bearable than lip fillers, and that patients who seek this treatment have most likely undergone other painful procedures to treat their scarring before this. As such, they may be more tolerant to having filler treatment done without any anesthesia. The patient should be advised to expect injection site redness and bruising, and should also be fully informed on how long potential side effects may last in order to manage their expectations. With proper technique and procedure, using filler can indeed be effective in improving the look of pitted or depressed atrophic scars. Results are instant and will improve over the weeks after injection due to the dual effect gained from the procedure: the filling in of the scar, and stimulation of collagen production in the dermis caused by the needle. That being said, it is important to note that not all scars will respond equally to this type of treatment. Treatment efficacy is often dependent on the type and depth of each scar and the state of the underlying tissue. Typically, broad rolling scars that are distensible (stretches when surrounding skin is stretched) produce the best response to fillers, but treatment can also be successful with boxcar and icepick scars that are not too narrow. It can be said that the most important outcome of treatment is the psychological benefit imparted to the patient. By the time a patient attempts this treatment, they may have been trying for years to improve their scars, often with little success. Even small improvements could mean a world of difference to the patient, by altering their mindset and increasing their well-being. Any dermal filler that has been deemed safe and effective for use could potentially be used for this type of treatment. As such, the choice of filler should be dictated by the experience and expertise of the practitioner. As the most common type of dermal filler on the market, hyaluronic acid-based fillers are a natural choice. If using hyaluronic acid dermal fillers, a classic filler that has good lifting power but is moldable, like Emervel Classic (rebranded as Restylane Refyne), is recommended for direct lifting of scars, while a low-viscosity skin-booster like Restylane Vital/Vital Light is a good option if using a more encompassing skin improvement approach. Semi-permanent, non-hyaluronic acid dermal fillers can also be used such as Sculptra, a filler made of poly-l-lactic acids. Sculptra stimulates neocollagenesis at the implant site, allowing its clinical effects to last several years. However, it requires multiple injections over the course of a few months to achieve results, and results are irreversible.1 Moreover, bovine collagen gel is an older form of treatment that is not always used at clinic level, and its bovine origin may be incompatible with the beliefs of some patients. The results afforded by bovine collagen gel are usually good, especially if used for depressed rolling scars, but will not affect fibrotic scarring. Also, results typically last only 2 to 4 months. Bellafill, a polymethylmethacrylate filler, is the first filler to gain FDA approval and licensing in the United States to treat acne scars. However, it is only used for rolling scars, and is not readily available in regions outside of the United States. Calcium hydroxylapatite fillers, sold under the brand Radiesse, are also available. These products consist of a cellulose-like, water-based gel with microscopic calcium hydroxyapatite particles designed for volume creation. Radiesse fillers are not as malleable as hyaluronic acid fillers, but give longer-lasting results. It is not recommended to use permanent fillers on acne scarring, as it would not be possible to reverse any potential unwanted effects if needed. This treatment works best on scattered, deep scars. The fillers of choice for this type of treatment are Juvederm Ultra, which is extremely versatile, and Emervel Classic, which is malleable and adaptable. As with all injection procedures, your patient will most likely experience reactions such as swelling and bruising. These may be visually displeasing, but are often mild and self-resolving. The most common unintended events seen with this procedure are the formation of nodules, lumps, or visible filler, all of which are caused by improper placement. These complications can be prevented by careful examination and massaging the area after the injection. The patient should be made aware beforehand that in the cases of very shallow scars, a balance must be struck between a filler placement that is superficial enough to lift the scar but deep enough not to be seen. If necessary, any lingering or persistent visible filler can be dissolved with a hyaluronidase treatment. 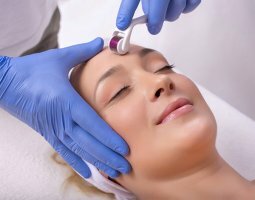 The method used for treating acne scars is relatively straightforward, but is more time-consuming than other filling techniques. However, the process is intricate and may be complicated by the presence of local edema. As such, methodical injection is vital to treatment success. Cleanse and disinfect the area to be treated. Document the process by taking clear photographs, an important record and procedural tool. Show these photographs to the patient and discuss with them the plan for treatment, identifying areas or individual scars that cause the patient the most distress. Only once a clear plan has been outlined and informed consent has been obtained can the treatment commence. Start treatment at the furthest edge of the area to be treated and systematically work into the area scar by scar. To treat a scar, insert the needle bevel up under the scar and begin injecting when the needle is directly under the pitted/dipped area. Immediate lifting of the area should be observed. Withdraw the needle and assess, repeating the injection as necessary until the desired effect is achieved. Some scars are not apparent unless seen at certain angles. As such, it is important to refer to photography while working through the treatment area. If there is a scar on the photograph that is not apparent on the patient, reposition your viewing angle, or move the patient. In the cases of scars with obstructive tortuous tissue that causes migration of the filler, withdraw the needle and massage the filler until it is not noticeable. Then, use the needle to subcise the scar tissue by moving the needle back and forth in different directions. Once the scar tissue has been adequately broken down, re-attempt to place the filler. Continue across the treatment area, massaging the filler underneath each scar as you go along. It is important to work methodically, because local edema will progress and make individual scars difficult to distinguish. When local edema or entry points make any further procedure impossible, stop the treatment. At this point, you can wait until the edema has settled and resume treatment then, or postpone the remainder of the session to a future time. Prepare for the procedure as above. Treat the entire area as if performing a skin booster treatment, using similar multi-injection point techniques and shallow placement. When encountering individual scars, concentrate several product placements directly under the site. Massage the entire treatment area, checking that the scars that were treated individually are not raised. Acne scarring is not only a superficial condition—it also has a psychological impact on the patient. Many afflicted patients seek new types of treatments that are effective in improving their condition, exhausting vast amounts of money in the process. Usually, fillers are the last resort for these patients, a fact that has both pros and cons. On the one hand, patients will appreciate any small improvement gained from treatment, but on the other, they are usually in a mindset that makes them very vulnerable and causes then to have unrealistic expectations. While fillers are a good solution for many patients, they have to be realistic about the degree of improvement that may be achieved. To accomplish this, point out the scars which may benefit from treatment, and those which may not; conduct a thorough consultation; photograph the areas well; and ensure that the patient is aware of the expected swelling and bruising that will happen with treatment. As with any cosmetic procedure, it is important to select your patients thoughtfully and manage their expectations carefully. 3: Michael H Gold, ‘Use of Hyaluronic acid fillers for the treatment of the aging face’, Journal of Clinical Interventions in Aging, 2(3) (2007), 396-376. 5: Varnavides CK, Forster RA, Cunliffe WJ, ‘The role of bovine collagen in the treatment of acne scars’, British Journal of Dermatology, 116(2) (1987), 199-206.